This data comes from Wikipedia's list of steampunk works. I didn't see any glaring mistakes or omissions, so I ran with it. I've called out a few moments in steampunk history, though they are not meant to be comprehensive or even telling. Mostly, they're just some of the steampunk works that influenced me. Data from Wikipedia, retrieved July 7, 2012. Something new hits the populace. People get excited about it and create more stuff like it. Then eventually they get bored of it and the trend goes back down. But, if enough people still haven't heard of it and a second new thing comes along within the trend, the cycle could start again. It could even get bigger as a whole new group of people get into it, and the old people go, "Wait, that's a thing again? I was into that when we called it 'steam-driven punk.'" I think it's safe to say THE DIFFERENCE ENGINE and its precursors sparked that first little bump from '92 to '95. 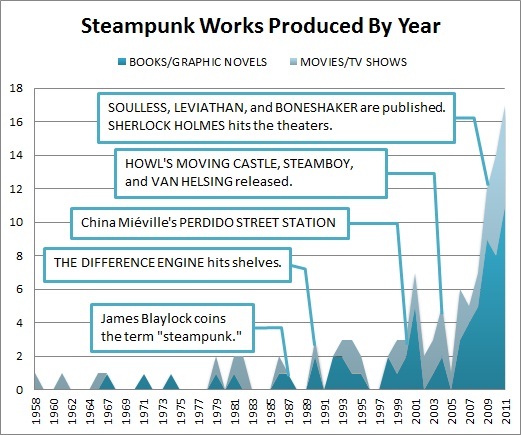 I don't know what triggered the spikes in 2001 and 2004 -- maybe PERDIDO STREET STATION, or maybe the manga STEAM DETECTIVES or even WILD WILD WEST (a bad movie can start a trend as much as a good one, as people think about what might have been great). Now we're in the middle of a whole new wave, triggered by movies like STEAMBOY and THE PRESTIGE, books like AIRBORN and MORTAL ENGINES, along with everything that came before it as more and more people explore the history of steampunk. This wave is big, though I suspect it's coming to its end in the next couple of years (at least on the book side, see below). It was interesting to me that almost every bump in the graph started with books, then film and TV carried the cycle while books backed off the trend. This really shouldn't be a surprise, since most movies are based on books. But it's important to remember: if you write steampunk because of SHERLOCK HOLMES or LEGEND OF KORRA (for example), you might be too late to cash in. We see something we like and go, "Cool! I want to make something like that!" So we do, though even with self-publishing, it takes a long time to make a (good) book from scratch and get it to market. That's why bumps tend to occur a couple of years after certain inspirational works. But here's the thing: we're not the only ones who have that idea. That's why agents get hit with waves of similar stuff: vampires, werewolves, angels, people who control the elements. They're often triggered by the earlier release of something that inspired a bunch of people. That inspiration is a good thing, but chances are, by the time you've heard of a trend, you're already behind the curve. This is why we're told not to write to trends. What do you do about this if we genuinely love the trend? I mean, I've loved steampunk for as long as I knew it was a thing (I think that would be Brisco County Jr. in '93). I still love it. But what if nobody else does? Because eventually it will trend again. Maybe. Just hang on to the idea and try to time it later after the hype has been forgotten. Because if you really love whatever it is, you could be the one to trigger the next up-cycle. When someone writes something just to cash in, it shows. Steampunk for steampunk's sake is boring. But when you write something out of true passion, it can transcend the trend to become something awesome. So no new conclusions here: Screw trends. Write what you love. But being aware of what's trending -- and what hasn't trended in a while -- is a good thing too. What do you think? Have you ever written to a trend? Are my chart-based conclusions way off? I think writing what you love AND being aware of trends is useful. Twice already this year, what was "trending" affected my submission schedule and a work that was on submission. It can be the difference between a rejection and an offer. It's not like I would have changed my story for the trend, but it did help me adjust my expectations. It seems like only two of the waves started with books before movies/TV and two were just books. All the others either started together or were caused by movies/TV. However, I would agree that the modern trend with movies is to make them based off of books because Hollywood doesn't seem to have any good writers anymore. Heck, they can't even take something that was amazing and repeat that. I'm looking at you, M'Knight. When it comes to publishing, I have noticed the trends on the book store shelves and have wondered why certain ones struggle and die off while others just blossom. But with writing it, I like the advice of just writing: someone will eventually come around to like it and if not, that doesn't matter either. With the steampunk trend happening, I kind of liked it back when it was underground and not a fashion statement. Write a good story, write it because you love it and the genre it's in and if you're lucky, you'll be the breaking wave of a trend. That's my .02. I loved Brisco, Howl's Moving Castle and several Steampunk books I've read, but I think I like Steampunk most because it's alternative history, which I adore. I've been noodling around on a Babylonian Steampunk Empire concept for awhile now and I'm not at all satisfied with the story or even the characters. But I love the idea enough I can't let it go, so I know there's something there. Le Sigh. Love the chart. Especially because I'm so enamored of steampunk, yet didn't know it's history (shame on me). I was inspired to sketch an asian-influenced steampunkery tale a couple years ago, well before Korra, but Korra just reminded me how much I loved that idea in the first place. I may yet write it someday. Whether it will be on the up or down swing of a trend, I have no idea (but as you say, you should only write it if you love it in the first place, and then it doesn't matter). p.s. this is one of the freedoms of self-publishing - it doesn't matter if it's part of a trend or not, there will always be some readers who will appreciate your work. Your chart shows the waves of published works, not readers who are appreciative of it, which I think is a much steadier number. This is fascinating. I'd read on one agent's blog the opinion that once a trend has gone to Hollywood and movies are being released, that trend is on the wane and publishers have lost interest. I think that's a factor or how slowly both industries move, and that Hollywood always follows publishing, because the investment is far higher in a film than a book, so Hollywood wants built-in audience. I think you might be on to something about the way trends resurface after a gap of time though. I guess that means we can expect a resurgence in vampire stories in, say, 6-7 years? I loved steampunk since I was a kid, long before the term was even invented. HG Wells and Jules Verne were my heroes as a kid. Heck, I didn't even know the word steampunk existed when I started writing my latest project. Not a clue. I wouldn't know how to NOT write what I love. Trends are important, from a marketing perspective, but it can't be the sole driver. You had me at "chart." I missed you more than anyone. Your analysis, while essentially irrelevant to anything I intend to do, is so well researched, and always so intelligent, it's always such a pleasure to read. Would you include the Final Fantasy and Lost Oddyssey video games? Both have airships and lots of fantasy steam-powered elements. 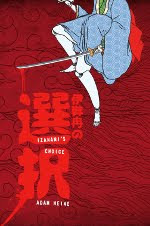 Anime and manga have embraced the steampunk thing for awhile -- I'm not very schooled in it but my husband loves anime and that's how I first heard the term back around 2002 or so. Ha! I never consider interpreting charts like this! Totally gives me a new idea for writing something. Thanks! Also, I quoted this article on my Storify here: http://t.co/tkLwdKSy Hope you don't mind.